What is the cost of a Car Stereo installation? How much does it cost to have a new stereo fitted to my car? With so many different car manufacturers and models now there is such a variety of options with what you can do with your cars original head unit. This can be a great opportunity for you to get the perfect radio to suit your needs. Whether you want a Bluetooth Car Stereo to use just like a hands free car kit or maybe you want to upgrade the old FM radio to one with DAB digital radio. 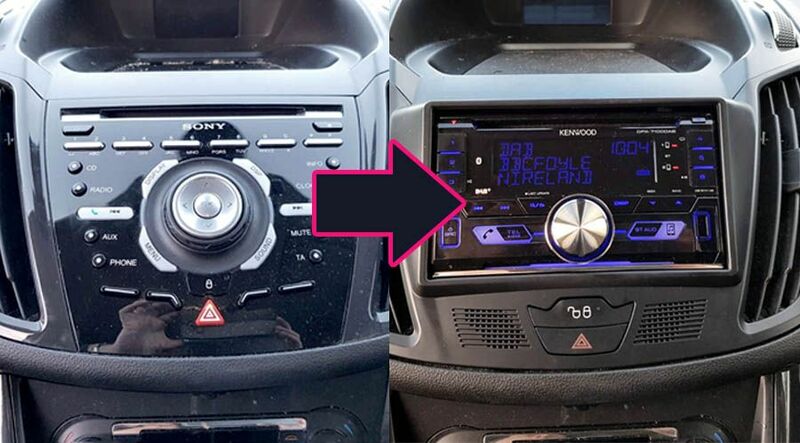 Have you bought your new head unit and are looking it fitted or maybe want it switched over from your previous car? Either way the first thing we need to establish to get your price for installation will be your cars year, make, model and possibly even a picture of the current radio. Once we get that we will then be able to sort out the parts and get you a price quickly. Fascia or plastic surround for the radio – insures the radio looks neatly fitted and not completely out of place. Wiring – connects your radio to the current system in your car. Aerial adaptor – connects your old aerial system to the new radio. Steering control wiring – allowing you to maintain use of your steering control functions with your new car stereo. Patch lead – Allows you to maintain stalk functions of the car allowing steering controls etc. to work. Fitting – De-stalling old car radio and installing new one with all wiring and fascia including Bluetooth mic and extra DAB aerial (if available). Due to the different types of vehicles with some having more complicated wiring systems or larger fascia plates there is ranging prices and prices may vary from above. Hopefully this will give you a rough estimate of what to expect when going for a new radio. If you need an exact price just give us a call and speak to our helpful team who would be happy to help.